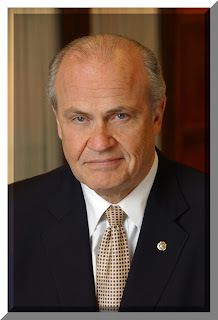 I want Fred Thompson to win the Republican nomination. (Did you hear he’s surging in South Carolina?) And it’s not just that the other candidates stink for various and sundry reasons–which I’ll run through momentarily–or that he’s the best of the worst or something. I want Fred for his own reasons. John McCain: He marches to his own little drummer who doesn’t know the conservative rhythm. Of course there’s McCain-Feingold, that nifty little piece of legislation whose chief beneficiary was George Soros, but there’s this other little thing: his only consistent conservative feature is his military stance, which I admit I admire. It’s not enough. Mitt Romney: Tall, presidential looking, good hair, smart. I should love him, but I don’t. My suspicion isn’t evangelical in nature–ewww, he’s a Mormon, he frightens me! It’s more, ewww, he succeeded in Massachusetts, he frightens me! Also, he came across as bitchy in the last debate. Rudy Giuliani: I like him. He gives the press heck. He won’t back off a fight. He possesses the right kind of moral indignation at psychopaths routinely given a pass. Still, he’s no conservative. But he’s better than most. Ron Paul: He’s a loon. Mike Huckabee: He’s a loon with a TV evangelist grin, but boy can he smile. His post-loss speech in New Hampshire was euphoric hope–like Obama but pasty, white, and Boomerish. And then there’s Fred Thompson. Fred Thompson has it all. He has conservative cred. He has experience. He can communicate. He gives journalists the respect they deserve. But there’s more. A president has to have a certain je ne sais quoi. Fred has it. He’s middle American. He has the slight lilt. He comes across as real. He’s likable. Guys can imagine going out for a beer with him. Girls dig him. Now, that above assessment might bug you, but it’s important, especially in the general election. Voters dig Alpha Males and so do certain bloggers. Can you imagine going for a beer with Romney, Huckabee, or Paul? No. How about Edwards, Clinton or Obama? Maybe Obama, but it’d be a martini or glass of wine, let’s be real here. Giuliani could have a good time at the bar, but aren’t you just a little afraid he might go on a bender? Thompson would have a drink, talk sports, know the waitress’ name and go home to his wife. About women. I dig Thompson. He’s not conventionally cute. Heck, none of the candidates are that great looking save Romney. Thompson has that easy talk, the relaxed authority that is fun to be around. He’s the guy girls choose and the other dudes marvel. I happen to think that the more people learn about Thompson, the more they’ll like. Soon we’ll have a Huckabust. And then Romney will lose his zip. McCain will hang in like the pit-bull he is. Giuliani will have misplayed his cards and gambled too big. And Ron Paul will be recommitted to the institution he broke out of to campaign for President–oh yeah, that would be the House of Representatives.